James W Blackbourn was born in Barkston in 1888. His parents were George Henry (a gamekeeper, born Leasingham) and Mary Tow Blackbourn (nee Patchett) from Brandon. They’d moved from Holdingham to Barkston in the 1880s. By 1911 George and Mary had moved to Marston and James (22) was living in Barrowby, where he worked as a joiner for Mr Judson, wheelwright. By 1918 George and Mary were back in Barkston, running The Stag. They later moved to Denton. 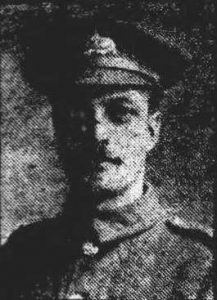 In Mar 1916 James joined the Lincolnshire Regiment, serving with 10th and then 1/5th battalions before being transferred to 10th Battalion, Essex Regiment. He was wounded at Bullecourt Wood, during the Battle of Arras in 1917 and awarded the Military Medal for gallantry whilst working a Lewis Gun. He was wounded again (gunshot) in Sep 1918 and sent to the 3rd Western General Hospital, Newport Section in South Wales. He died here of wounds on 28th Dec and was buried in Barkston Churchyard.